Shinzo Abe's image as a strong leader has bolstered his ratings amid rising tensions over North Korea's nuclear arms and missile programmes and overshadowed opposition. 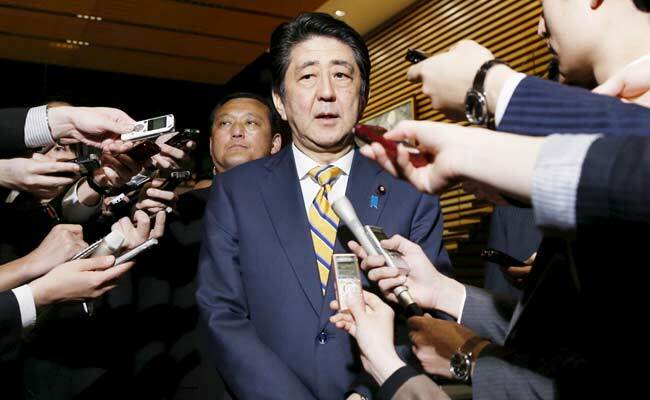 Tokyo, Japan: Japanese Prime Minister Shinzo Abe was expected on Monday to announce a snap election for next month to take advantage of improved ratings and opposition disarray, despite criticism that he is creating a political vacuum amid worries over North Korea. Prime Minister Shinzo Abe will hold a news conference at 6 p.m. (0900 GMT), Jiji news agency reported, after meeting party executives and will likely put pledges to spend on education and child care, stay tough on North Korea and revise the constitution at the forefront of his campaign. Abe, whose ratings have risen to around 50 percent from around 30 percent in July, is gambling his ruling bloc can keep its lower house majority even if they lose the two-thirds "super majority" needed to achieve his long-held goal of revising the post-war pacifist constitution to clarify the military's role. That was higher than the 27.7 percent a Kyodo news agency survey showed voting for Abe's party, with 42.2 percent undecided. Abe's image as a strong leader has bolstered his ratings amid rising tensions over North Korea's nuclear arms and missile programmes and overshadowed opposition criticism of the premier for suspected cronyism scandals that had eroded his support. Given recent cases abroad where elections have led to unexpected results, however, political analysts are not ruling a "nasty surprise" for the Japanese leader. Ruling Liberal Democratic Party senior official Koichi Hagiuda on Sunday brushed off concerns about a political vacuum during the election campaign with current Korean tensions. "Even if there is a contingency during the election, I am confident that we can respond properly," Hagiuda said on public broadcaster NHK. Abe on Monday asked his cabinet to compile a 2 trillion yen ($17.80 billion) economic package by year end to focus on child care, education and encouraging corporate investment, while maintaining fiscal discipline. Tokyo Governor Yuriko Koike announced on Monday - just hours ahead of Abe's news conference - that she would lead a new conservative, reform-minded "Party of Hope" to provide voters keen for an alternative to the LDP. "Our ideal is to proceed free of special interests," she told a news conference. A junior cabinet minister from the LDP, Mineyuki Fukuda, said over the weekend he would leave the ruling party to stand in the election from Koike's new group. An LDP internal survey showed seats held by the LDP and its coalition partner Komeito could fall to 280 from the 323 they now hold, the Nikkei reported on Saturday. Reforms enacted last year will cut the number of lower house seats to 465 from 475.